I absolutely adore this chronicle :) thanks for brightening my day Momo! What system do you use in the kitchen? Hee, a silly episode really. Kitchen, you mean the cage kitchen or the floortime human kitchen? Thank you for adding many smiles and laughter to my day. Emma reminds me of another guinea pig we had. She would attack and guinea pig and any hand that was in her vicinity. 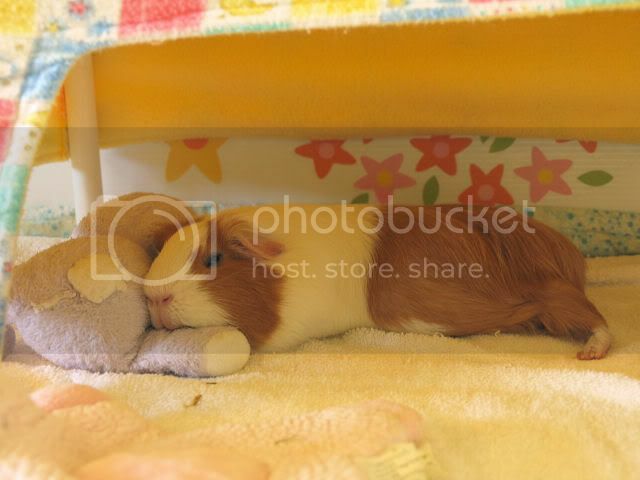 But then we brought in one of those "Tyson Bean Baby " guinea pigs. She adored that. SHe was cuddle up with it and attack anyone who tried to take it away. Now, that is a project that lissie(gl memeber) and I worked on for quite some time. It turned out quite differently then we first envisioned it, but after implementing it for 2 months now, I am loving it. Give me a few days, I will take pictures and put it together for you. Thanks Momo! I would very much appreciate it because I'm desperately trying to find a new cage system. A quick question, do you guys put anything on the patch of skin where the SubQ was administered? It seems to be itching and Beibei is scratching quite a lot. The picture of Tamago and Beibei sharing the food is beautiful! Beibei does look like she is having a good day. Yay! Momo, thank you for sharing the good news with us. And thank you for sharing your feelings. Just a quick update on Beibei's *itchy back*. I applied some silvadene(sp?) left over from Emma's urine scald and it seemed to make it all better. Talishan kindly and promptly answered my question through emails, and now she is no longer fussing or trying to scratch her back anymore. Ben and I celebrated our anniversary. I am so pleased Beibei isn't itching now you have applied the magic cream. She looks very relaxed, what a sleepy-head! Please, don't say more. ;) But Happy Anniversary!